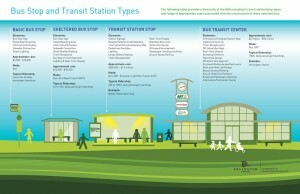 Station shelters and amenities: The County issued a Request for Proposals for all above-ground features for the 23 stations. The contract will be awarded in fall 2018, with fabrication of the shelters expected in spring 2019. Construction: The County plans to issue an Invitation to Bid (ITB) in spring 2019 for the first phase of transit station construction (four to five stations). The ITB will cover site-specific work including installation of subsurface foundations, sidewalk/platform, large shelter, seating, real-time information and other amenities. The first phase of construction will include work at up to five locations - Buchanan east and westbound, Glebe Road east and westbound, and Oakland westbound. The eastbound Glebe Road station may be delayed due to easements being negotiated with the adjacent property owner. New transit stations along Columbia Pike will serve two purposes: accommodate riders on the busiest bus transit corridor in Virginia, and serve the community’s vision of transforming the Pike into a more transit-oriented, pedestrian-friendly “Main Street.” New stations will make transit along the Pike easier, safer, more attractive and accessible – encouraging more people to use it. 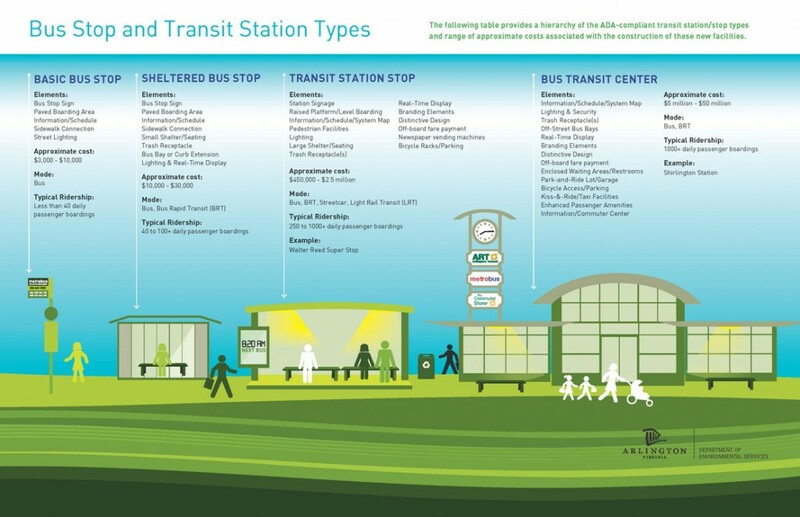 Compared to a typical bus stop, transit stations are designed to shelter more passengers and include real-time transit information displays, a higher curb for easier vehicle boarding, lighting for safety, and seating. Directly oversee construction – All consultants and contractors will work directly for the County. In comparison, Arlington designed the Super Stop prototype and WMATA managed its construction. Control costs throughout design and construction – This includes identifying risks early in project development, and enhanced monitoring and management of costs. The County Board voted in October 2016 to further reduce costs for the Transit Stations project by choosing a design concept that includes the option of the stations being partially assembled in a factory, rather than built in place. The Board reaffirmed the “kit-of-parts” design concept, introduced in May 2014, which offers high-quality design and materials for the 23 planned stations. Partially assembling the stations at a factory and then installing them on-site could reduce estimated project costs and minimize construction impacts by reducing the time needed for on-site construction. An open house was held on April 28, 2015, for members of the community to review the 50 percent design and provide input on the importance of various station amenities and the proposed placement of station features. Materials from the open house are listed below. The County Board approved $13.7 million for the planned 23 transit stations in Arlington's FY 2019-2028 Capital Improvement Plan. The transit stations program is funded primarily by federal and state funds and local commercial real estate tax revenues that can only be used for new transportation projects. The estimated cost for each station is comparable to stations for the Crystal City Potomac Yard Transitway and other light rail, streetcar and bus rapid transit systems across the nation.